As the 2015 Snowmageddon blanketed Chicago, I found myself with time to get back to my adventures in Minecraft! Last we met I had created the start.server.command file, which actually launched the server. Next step, create the StartCanarymod. command file. After figuring out that TextWrangler works best for writing command files, the StartCanarymod.command file was pretty easy. From there it was a matter of downloading the RaspberryJuice plugin and copying the necessary file to the Canarymod folder. The last step was to download and copy several different files to the My Adventures folder. These were included in the 1.6.4 version, so I just copied them to my new folder. And, we’re a go! The server, plugin and world all initialized! Now, to test the Python and see if my server accepts the programming! Launching IDLE, I wrote my first program for Minecraft. Cue happy dancing! There’s my first Python programming of Minecraft! See it? Minecraft said “Hello Minecraft World”! Your first program…always an exciting time. After several weeks of challenges, I finally have a working Canarymod Server and files to give the avtivities in Adventures in Minecraft a go! Adventures in Minecraft works on a teacher computer! Yay! 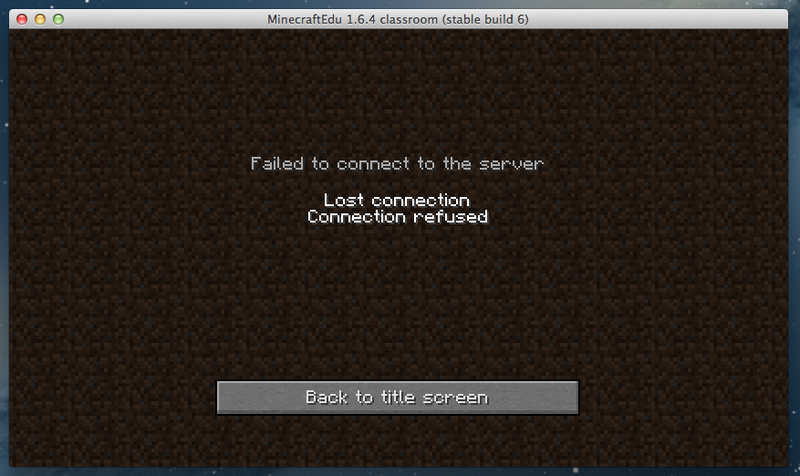 Adventures in Minecraft doesn’t work on the student computers! Boo! Adventures in Minecraft does work with Minecraft Edu! I need to build a Bukkit server compatible with MinecraftEdu 1.7. Gulp! Creating a Bukkit server is a new challenge that I’m up for, so let’s get started. Okay, I needed to download Bukkit…easy! I started by reading the directions. I know, imagine that! Reading the directions first. Who the heck does that. I created the required folders and searched for a Bukkit server. My Google search led me to http://bukkit.org/. I skimmed a few forum posts, read how to set up a server, making my way to the BukkitWiki where I found a link to the downloads (http://dl.bukkit.org/downloads/bukkit/A). 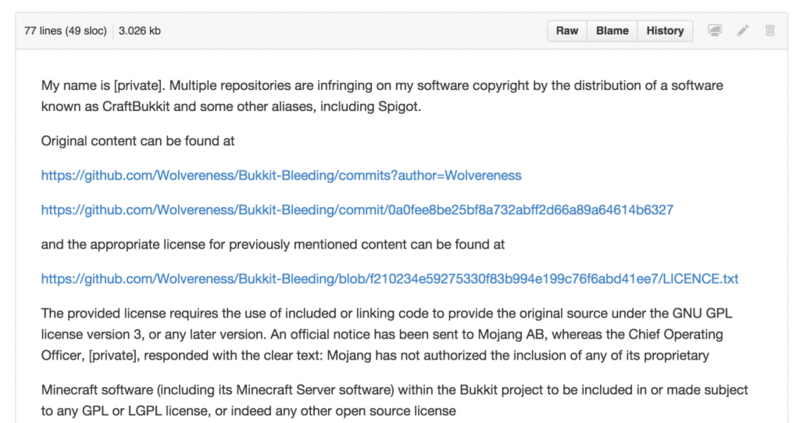 So, this guy, Wesley Wolfe is claiming copyright on the Bukkit server. Alright then, I’ll go to his site to get the download. Highlight and copy the GitHub url…paste and we’re good! Right? Ummm…did I miss something? The GitHub site is leading me back the to Bukkit site, which has a DMCA prohibiting the download of the Bukkit server files because of Wesley Wolfe’s claim on the Bukkit server. Running into a dead end, I went back to the GitHub site to look at the other repositories. Oooh! CraftBukkit! That’s it! I click on CraftBukkit ready for my download! 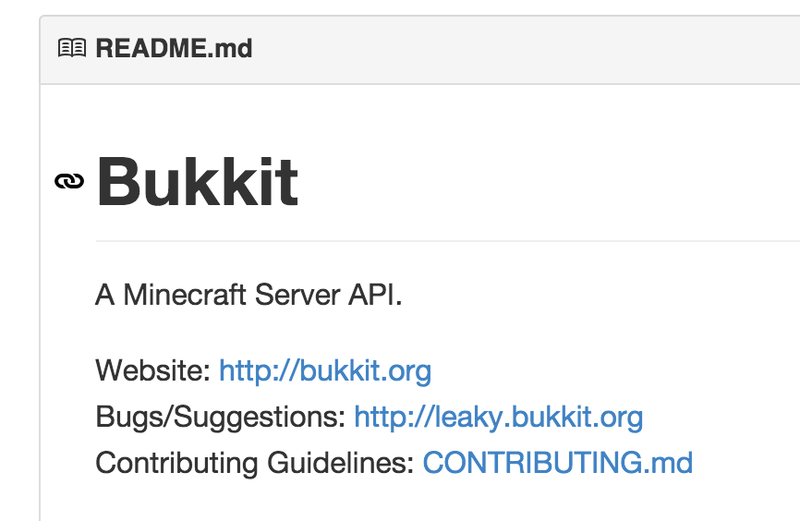 On first glance I was quite confused by the fact that this person (presumably) had DMCAed his own work, but I notices the “source” is the Bukkit-Bleeding repository. I spent some time digging through the files in the Bukkit-Bleeding repository, but couldn’t find a simple .jar file to download and I don’t know how to create one myself. 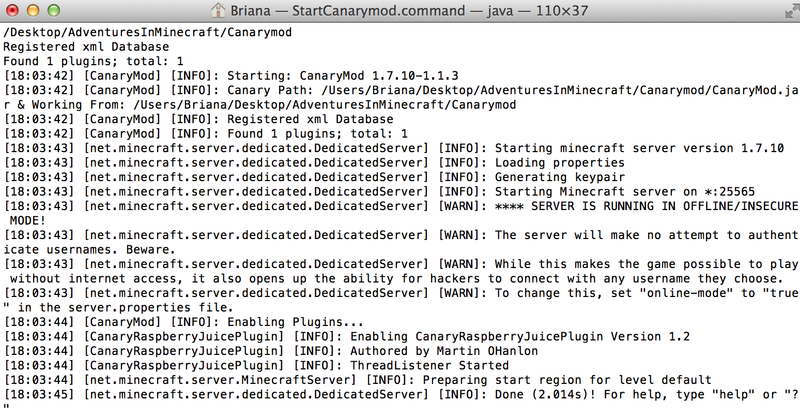 So, time for option two…CanaryMod. So, where did we leave of? Oh, that’s right…to the computer lab! As a tech admin I have greater powers than a classroom teacher and, of course, than students. As such, my excitement over writing my first Python script for Minecraft was tempered by the fact that my students might not have the permissions necessary to run all of this fun. I scooped up my laptop and external hard drive with all of my files and settled in for some testing. Hopes were high. I pull up a student login, got signed in and copied over the Adventures in Minecraft files. I went to launch Python and noticed it was no longer on our computers. What? Off to the tech office I trotted, donning my best smile and most pleasant voice in hopes of convincing someone to drop everything and install this software for me. Bad form on my part knowing how many people try this everyday and how often I have to gently tell someone that there are others needing more urgent assistance. But, I did it anyway. The upside is that I can download and install the sofware myself, I just needed a password! Lucky me, our tech was willing to pop in and enter the password for me. Signed in as a student…check! 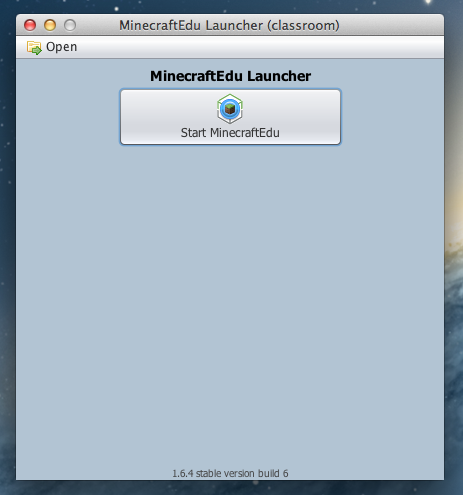 I launched the Bukkit server from the Adventures In Minecraft folder and launched Minecraft…Edu version. As I mentioned before, I knew this might be an issue, but I had to try. Everything launched, but because of the way our version had been packaged students do not have access to the launch Minecraft option, only the Edu version. It’s testing, so I launched Edu and tried to connect to the Bukkit server. No dice! Okay, our existing configuration wasn’t an option, but I knew we were almost ready to launch the 1.7 update. I scrapped my files and moved to the computer we were testng the 1.7 update on; starting the process all over. Before I began I knew this would be a longshot, because I was using a Bukkit server for 1.6 with a computer running Minecraft 1.7.Minecraft users know what happened next. It didn’t work! No surprise since it’s already know that your server and client need to be running the same version. So, what’s a girl to do? Make her own Bukkit server compatible with 1.7, of course! At the beginning of December my coaching partner and I were busy planning Hour of Code activities. During our planning I had the opportunity to dig deeper into Python and really enjoyed my learning journey. This journey got me thinking about how I could teach an elective on Python during the next session, so I started researching ideas, projects and resources geared toward middle school student. And what did I find? 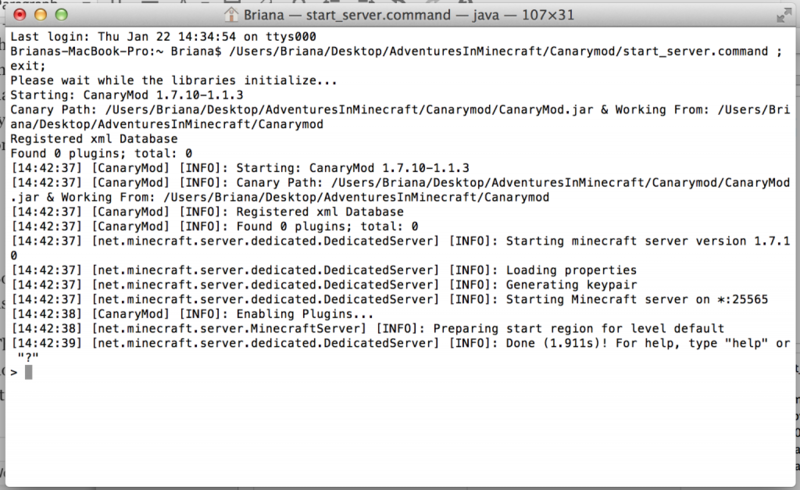 Well, the holy grail of programming electives…Adventures in Minecraft! 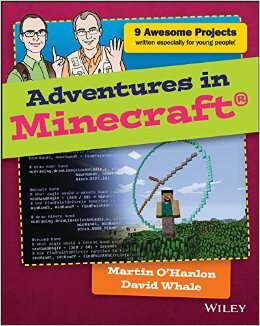 I came across this book thinking that it could have some fun ideas for my after school MinecraftEdu class. You know, build ideas, challenges, other fun things to keep the kiddos focused. 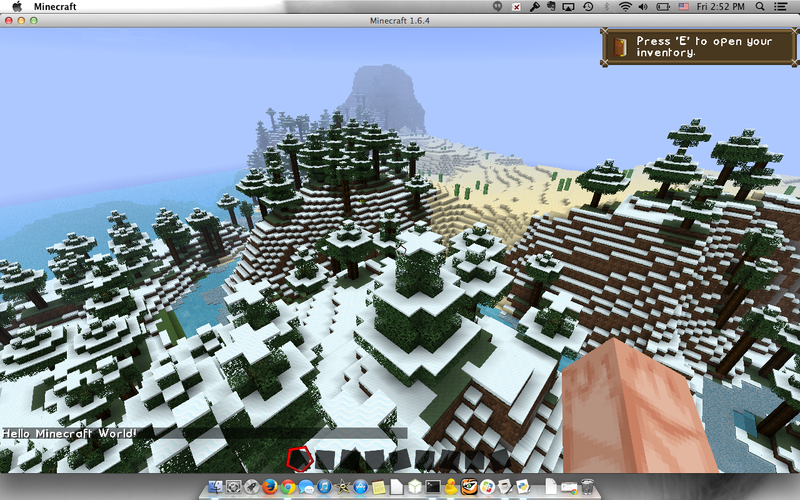 Turns out its WAY MORE that fun things to build in MCEdu, it’s about how to use Python to program Minecraft! Whoa…wait…what…? You can do that? You can actually program things in Python and have something happen IN Minecraft! I was hooked. I bought the book then and there, tossed aside the work I should have been doing and began learning how one programs Python! As I began reading the book and downloading files from the companion website I had a sudden realization that all this may be for naught. Why, you ask? Because I am using MinecraftEdu and work in a school. Nothing every works the “way it’s supposed to” in a school. I proceeded anyway determined that it would work, one way or another! As I continued along I found that this book, published in November 2014, was already out of date (as is often the case with techie books). The book is based on Minecraft 1.6 and I’m on 1.7 MCEdu! Ugh! This isn’t going to be easy. Skip to Friday morning…I knew my work computer was still set up for MinecraftEdu 1.6, so I downloaded and installed the necessary files to my laptop while the Chapter 1 how-to video guided me through the process. Adventures in Minecraft folder saved to the desktop, Python downloaded, Bukkit server up and running! We’re a go! With all of the setup completed, I becan my first Python program for Minecraft! Here it is! Here what is, you say? Right there, in the chat! I made that happen…WITHOUT typing it into the chat window! Okay, so that may not seem so impressive, but every programmer starting a new language must start with a Hello world! script! With the knowledge that I could program Minecraft on a school computer as a teacher, I set off to the computer lab to see if a student could do the same. Fingers crossed!